Voter behavior refers to the manner in which a voter will vote. Some reasons a voter will want to be involved can be the following: their income level; their knowledge of government; their desire to make a difference; their family traditionally being politically active; as well as a sense of civic duty to vote. Some influences to voter behavior can be the following: Family, a person will tend to follow the political opinions of their family; Education, levels of education can influence the way a person votes; Religion, religious views can coincide with a particular candidate or party and influence voter behavior; Ethnicity, statistical ethnicity party alignment can affect those of the same ethnicity; as well as Gender, men and women typically have differing political views. Many of these influences will cause voters to align with a political party. Having this alignment will usually cause the voter to vote for their party candidate, sometimes foregoing a more qualified candidate. There are many factors that influence voter behavior. First, we’re going to take a look at reasons for political involvement, or, in other words, what influences people to be involved in the political process. This includes voting, making political contributions to campaigns, or actually volunteering on a political campaign. One factor is income level. If someone has a high income level, it’s very likely they’re going to be politically involved. If someone has a high knowledge of government, they’re likely to be involved. If someone has a desire to make a difference, they’re probably going to see political involvement as a way to make an impact. Tradition also plays a role, specifically the person’s family. If someone’s family was never politically active, that person is probably not going to be politically active either. If a person’s parents always voted, well that person is probably going to always vote as well, because they feel like that’s the normal thing to do and what they saw their parents doing. Civic duty also plays a role. There are some people who go and vote who don’t necessarily feel like they’re making an impact or have a high knowledge of government, but they feel like it’s the responsibility of citizens to go and vote. 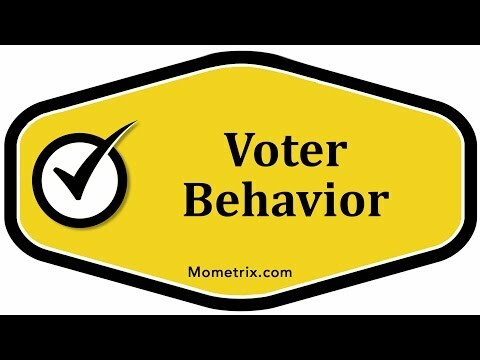 What influences people’s behavior as a voter? One factor is family. Like I said earlier, family plays a huge impact on someone politically. If someone’s family holds liberal views, they’re likely to be liberal. If someone’s family is conservative, they are likely to be conservative. Some other factors are education, religious views, ethnicity, and gender. When it comes to gender, an important concept that needs to be understood is something called “gender gap”, which is a term describing the various political differences between men and women. Basically, the gender gap implies that women are more likely than men to hold liberal views. Remember, this is called influences on voter behavior. You’re going to be wrong millions and millions of times, because there are millions of women who are actually conservative. Remember that while these different factors influence someone’s behavior as a voter, it doesn’t cause them to vote a certain way. They are sometimes going to be wrong. All of these factors influence something very important called “party affiliation”. Party affiliation is what political party people are a part of or tend to lean towards. Usually, this is going to be the Democratic Party or the Republican Party, but it could also be a number of smaller parties, or they could even classify themselves as an independent. All of these factors here influence someone’s party affiliation. The number one influencer of party affiliation is someone’s family. Party affiliation is the number one influencer of who someone actually votes for. If a Democrat goes to vote, they’re most likely going to vote for Democrats. A Democrat may vote for some Republicans, but for the most part they’re going to vote for Democrats. That’s kind of going to be their default. If they’re not sure of who to vote for, they’re probably going to vote for the Democrat. It works vice versa for Republicans. All of these factors here, family being the main one, influence someone’s party affiliation. Party affiliation is the number one influencer of who that person actually votes for when they go to vote. You could also say it’s the number one factor of who they support in a political campaign. If the person’s politically active, party affiliation is going to influence who they donate to or who they volunteer for. That’s a look at voter behavior.